The captains of the baseball teams would always fight over me…fight not to take me on their team! I was un-coordinated, un-chosen and almost always felt un-loved. If you have ever been rejected you need to know this truth: you are chosen! I absolutely love the word chosen. In the Greek chosen means preference given to the one chosen, by the one choosing, for the purpose of having a relationship and the choice was made out of many other possible choices. Does that rock your world like it does mine? God chose you, not another person, you specifically, out of many other possible choices, girl! God knows everything you have ever done, are doing now or will do in the future. He also knows what your most secret thoughts are. He even knows what you will say before you say it. And He loves you anyway. Chose you anyway. Died for you anyway. And He chose you before He laid the foundation of the world. Before He ever created one tree, filled the oceans with water, plastered billions, upon billions of stars across the sky, and even before He named each of those stars… He. Chose. You. He didn’t want zombies to serve Him. He wanted children to love Him. He wants to talk to you; to listen to you; to interact with you; to have a relationship with you. He loves you and wants you to love Him. He chose you to enjoy you and for you to enjoy Him forever. That truth is staggering to me. 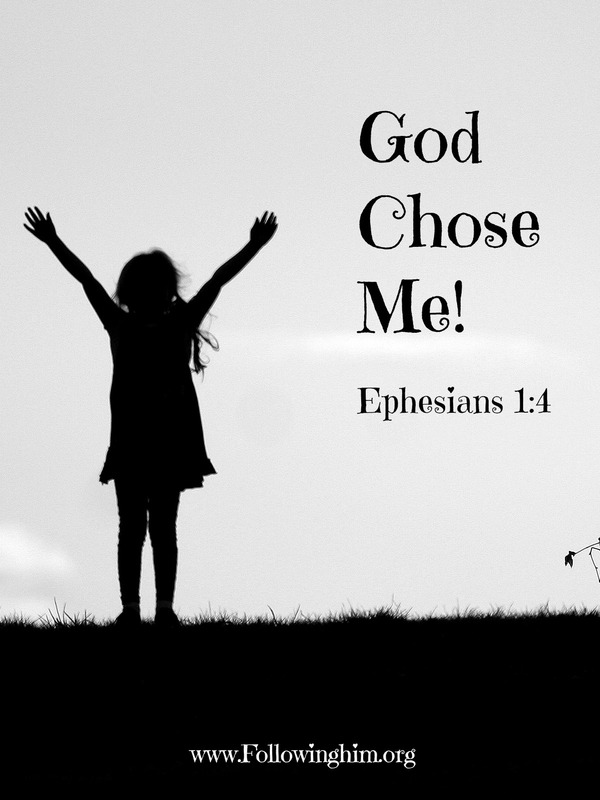 Would you stop right now and say out loud if possible, “God chose me!”. Lord, I have no idea what this precious woman has gone through in her sweet life. I have no idea what kind of rejection she may have experienced, but Lord, I’m asking You to enable her to understand that You, the Maker of heaven and earth, loves her, chose her, that You will never leave her or forsake her and that she is very, very special. Amen. Debbie, What a wonderful site — one fill with your sweet sharing of the love of our LORD! May your ministry be blessed with many changed and chosen lives and may this wonderful site have many, many followers. All for the Glory of Christ Jesus. Amen. Marilyn, thank you so much for those kind words! I would love your prayers for this new ministry. I so want to pour out Truth to women. I so hope our paths cross again one of these days!